I’m guessing it’s far enough along in the month of December where a few of you may be ready to take your Christmas trees down. While some of you may gasp “Why! 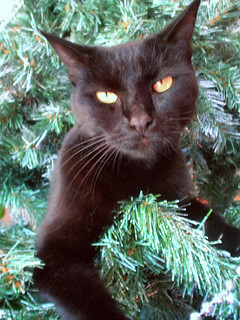 ?”, the reason is clear for others: Sometimes our cats simply will not leave our Christmas trees alone. 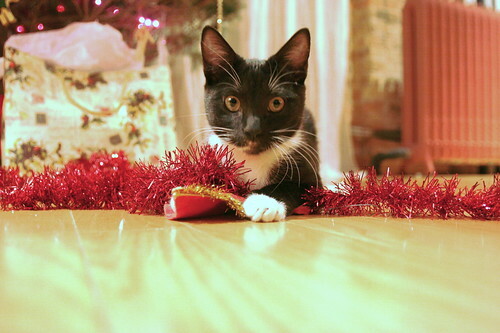 For some the desire to play with – or in – a Christmas tree can be as strong as a cat’s connection to catnip. It’s irresistible. And odds are your cat is convinced that you put up the tree not to celebrate the season, but as a huge gift for him. That said, I was not surprised to see the topic being discussed on the CH Cats & Kittens Facebook page the other day. This is especially important not only because Christmas trees can be toxic to our pets, but many holiday decorations are dangerous for them, too. Anyway, Erin asked the CH Facebook group if anyone could offer suggestions for having a Christmas tree and CH cat. Erin said her Grace is quite the explorer, and she’s nervous that Grace will want to explore the tree – which could certainly end in a disaster! Here are some solutions CH cat parents suggested, plus a few of my own. And of course, if you have anything to add, please feel free to share in the comments! If you own a number of delicate or cherished ornaments, you may want to consider not putting them on the Christmas tree, just in case your cat pulls them down or they’re knocked off. If you’re afraid your cat may pull your tree over, consider purchasing a sturdier base. Another idea: If your tree is located in front of a window, tie the top of the tree to your curtain rod. Anchoring your tree will increase its stability. Consider spraying a bitterant on your tree to make it less palatable to your cats. Also consider purchasing a concolous fir, which smells like citrus. It may repel your cat. Don’t hang any ornaments near the bottom of your tree. If you do hang a few near the bottom of your tree, make sure they are your softest, least breakable ones. Instead of putting up a large Christmas tree, consider purchasing and decorating a smaller one that can be put up on a pedestal or a table. If your cat tends to attack your tree while you’re out of the house or asleep, consider wrapping the bottom portion of your tree in a bed sheet. As crazy as this sounds, it really did prevent CG from going after a tree one year! I tuck the bottom around the base, then gently push the top of the sheet into the branches. Purchase a pet gate that can be set up around the tree. If it becomes too much trouble, consider going without a Christmas tree for a year . Do you have any other suggestions – or perhaps stories from when your CH kitty got a little too nosy? Please share in the comments!